At the end of the nineteenth and beginning of the twentieth centuries, faithful Poles across the United States began taking issue with how the German and Irish-led Roman Catholic Church was dictating their religious lives. On August 14, 1917 Andrew Drabczyk, Jacob Nowacki, Frank Konecki, and a coalition of other parishioners from Holy Trinity Roman Catholic Church met at Joseph Stachura Hall with Right Reverend Walenty Gawrychowski of the Holy Mother of the Rosary in Buffalo about organizing a Polish National parish in the Cataract City. By the end of the meeting the group formally established a parish and dedicated it to St. Michael the Archangel. 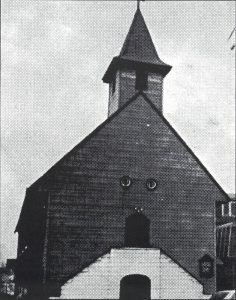 While the parish was being established, a Swedish Lutheran church at the edge of the neighborhood was beginning to falter. 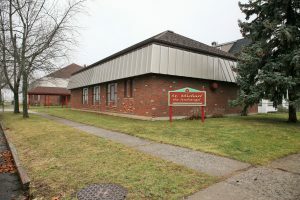 Soon St. Michael’s was looking for a home and the Lutherans were more than happy to sell them their former church. One of the first projects the parish undertook was acquiring land for a parish cemetery. Again, Andrew Drabczyk and Jacob Nowacki led the project, this time with help from Thomas Szczesc and Joseph Janik. The four men purchased 16 acres on Saunders Settlement Road on June 14, 1918 on behalf of the church. After being blessed, it became the eternal resting place for the parishioners of St. Michael’s. Reverend Gawrychowski oversaw the church until Reverend Guzek was in place to run the parish. Father Guzek’s time would be brief and in the summer of 1920 Father A. Masahige became the parish’s resident pastor. Coming from New Castle, PA, Reverend Masahige quickly began working down the parish debt and building up the parish flock. His time at the parish would also be short, staying until about 1922 when he headed to Korona, FL. In his time, Father Masahige set up English language classes for his parishioners, and showed a deep dedication and pastoral care to his parishioners which would be followed by subsequent priests. As with many Polish National parishes the church saw a number of priests pass through its doors in a relatively short period of time. Reverend A. R. Wisloewski would eventually take over the church and would oversee one of the parish’s most important and well respected organizations, the Chopin Choir. Reverend A. W. Serbenski and Reverend Leon F. Wiechec also would take turns at St. Michael’s. Although each priest was only there briefly, they all tried to make the parish a better place. Father Serbenski oversaw a major birthday celebration for General Joseph Pilsudski that was attended by Niagara Falls Mayor Frank A. Jenss and New York State Senator Stephen Wojtkowiak, while Father Wiechec had the church redecorated as part of its 15th anniversary in 1932. Father Peter Styczynski would decorate the church again for the parish’s silver jubilee. As the church neared its golden jubilee, Reverend Chester B. Lach oversaw some major changes to the parish. First the congregation decided to build a new church building. 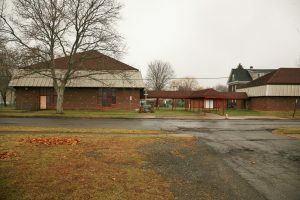 The project chaired by Vincent Pasisz hired architect Wallace V. Moll who came up with a modern low slung steel and brick church connected to a similarly designed community center. While the new church was underway another dramatic change happened when on April 9, 1967 when St. Michael’s celebrated its first English Mass. On June, 23, 1968 Rt. Rev. Thaddeus Zielinski, bishop of the Buffalo-Pittsburgh Diocese formally dedicated the new St. Michael the Archangel church. Three months later Janice Drabczyk and Frank Linza Jr. would be the first couple married in the new church. 75th Anniversary 1928-2003 Buffalo-Pittsburgh Diocese of the P.N.C.C. Orchard Park, NY: RW Publications, 2003. Print. "Arrangements Complete for the Celebration of 15th Anniversary of St. Michael's Polish Church." Niagara Falls Gazette [Niagara Falls, NY] 16 July 1932: 3. Print. Betzing, Clayton. "Saint Michael Polish National." Niagara County, NY Cemeteries, Lewiston. N.p., 2002. Web. 22 Feb. 2017. "Choir Which Will Sing at Annual Church Benefit Dance." Niagara Falls Gazette [Niagara Falls, NY] 25 May 1938: 15. Print. "CHURCH CELEBRATES ANNIVERSARY WITH SPECIAL SERVICES." Niagara Falls Gazette [Niagara Falls, NY] 18 July 1932: 20. Print. "Church Fair Successful." Niagara Falls Gazette [Niagara Falls, NY] 5 Oct. 1920: 1. Print. "Church Founder Drabczyk Dies Here at Age 64." Niagara Falls Gazette [Niagara Falls, NY] 5 Jan. 1954: 21. Print. "Church Observes Silver Jubilee." Niagara Falls Gazette [Niagara Falls, NY] 5 Oct. 1942: 15. Print. "Church To Install On Sunday." Niagara Falls Gazette [Niagara Falls, NY] 14 Jan. 1967: 5. Print. "Corporation Proceedings In Council." Niagara Falls Gazette [Niagara Falls, NY] 13 Dec. 1920: 13. Print. Ederer, Martin F. "The Polish National Catholic Church in the Buffalo Area." Am-Pol Eagle [Cheektowaga, NY] 15 Sept. 2005: 16. Print. Ederer, Martin F. "The Polish National Catholic Church in the Buffalo Area - Part 4 St. Michael the Archangel Church (1917)." Am-Pol Eagle [Cheektowaga, NY] 29 Sept. 2005: 8. Print. "Falls Church Organst Dies." Niagara Falls Gazette [Niagara Falls, NY] 1 Oct. 1948: 25. Print. "Falls Resident, Former Church Trustee, Dies." Niagara Falls Gazette [Niagara Falls, NY] 23 June 1950: 17. Print. "Jacob Nowacki, 94, Dies; Organizer of Church." Niagara Falls Gazette [Niagara Falls, NY] 1 Feb. 1954: 17. Print. "Linza-Drabczyk." Niagara Falls Gazette [Niagara Falls, NY] 15 Sept. 1968: 2-B. Print. "New Church To Be Built." Niagara Falls Gazette [Niagara Falls, NY] 8 Oct. 1966: 2. Print. "New St. Michael's Will Be Dedicate." Niagara Falls Gazette [Niagara Falls, NY] 1 June 1968: 3. Print. “Pastor Transferred." Niagara Falls Gazette [Niagara Falls, NY] 19 May 1931: 4. Print. "PGSNYS" Polish Parishes of WNY - Detail. St. Michael the Archangel PNCC, n.d. Web. 26 Nov. 2016. "Polish Church Sets Dedication." Niagara Falls Gazette [Niagara Falls, NY] 22 June 1968: 3. Print. "Polish Church To Say English Mass on Sunday." Niagara Falls Gazette [Niagara Falls, NY] 8 Apr. 1967: 2. Print. "St. Michael's Church." Niagara Falls Gazette [Niagara Falls, NY] 5 Nov. 1920: 17. Print. "St. Michael's New Church To Be Completed in 4 Months." Niagara Falls Gazette [Niagara Falls, NY] 4 Nov. 1967: 2. Print. "St. Michael's New Rector." Niagara Falls Gazette [Niagara Falls, NY] 24 Aug. 1920: 7. Print. “St. Michael's Polish Church Elects New Parish Trustees." Niagara Falls Gazette [Niagara Falls, NY] 17 Jan. 1970: 3. Print. "To Teach English Tongue." Buffalo Courier [Buffalo, NY] 23 Aug. 1920: n. pag. Print. “Will Hold Devotion." Niagara Falls Gazette [Niagara Falls, NY] 8 Mar. 1933: 2. Print.